We interrupt your regularly scheduled programming for an important announcement! 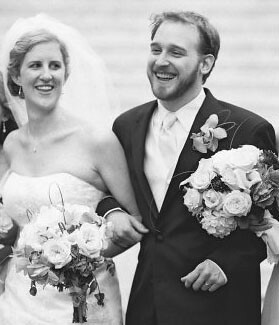 The photo above is of me (Heather) and my husband (Morgan). Morgan doesn’t blog here on DinnerCakes, though I do frequently mention him. My co-blogger Edwin (whose birthday it was last week!) and I are just chums. Click here to read more about Edwin and myself and how we know each other. Next week is going to be pretty exciting for me. On Monday I leave for California to begin a road trip through some of southwest US with a friend from college. This trip has gone through many (many) changes since its original inception back in June and, quite frankly, I’m very glad it still happening. We’re going with the flow, but our plan is to hit San Diego, Sedona, the Grand Canyon, Zion and Vegas! I’ve been trying to go through any leftovers I may have, as I’ll be emptying out the fridge before I take off. Soups are my usual method of disposing of extras. Just throw whatever veggies you have on hand with some mire poix, stock, a few spices and you’re bound to come up with something tasty. It’s hard to make a ‘bad’ soup, if you ask me; something you disdain putting in your mouth. My appetite was craving something more substantial, however, and I ended up in the delicious territory of pizza land. I don’t even remember the last time I HAD pizza. 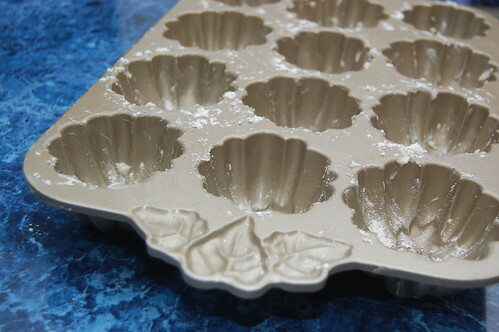 Treat this as more of a guideline or inspiration rather than a recipe. This is nothing more than the union of my personal taste with what I had available. Feel free to go nuts (I’ve never had corn on my pizza before). 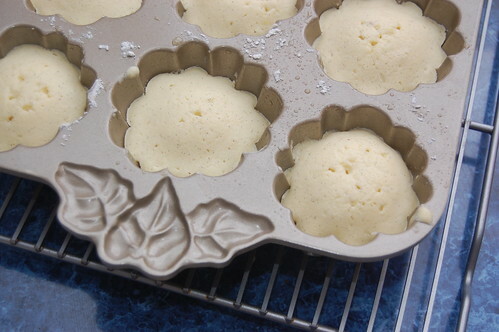 Pitta, muffin, real dough…. whatever tickles your fancy. Be sure to comment on where your creativity takes you. If you have a broiler, toast the bottoms of your pitas for a few minutes to give it a more close-to-the-original taste. I went with a frying pan (no oil), with moderately satisfactory results. Consider this an optional chip. Move a rack to one of the bottom levels and preheat the oven to 400. 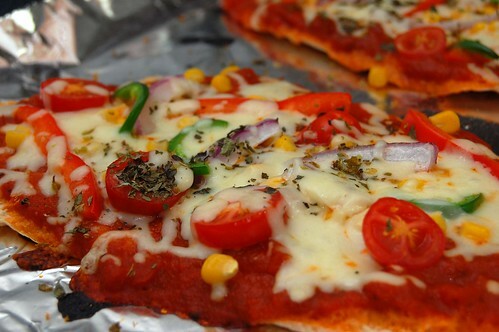 Spread several spoonfuls of tomato sauce (your own or from a jar) on each pita, leaving a half an inch for the crust. 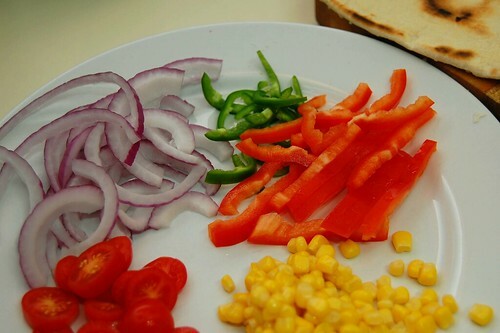 Add about half the cheese to your pitas then sprinkle with your vegetables. Follow with the remaining cheese and your herbs. 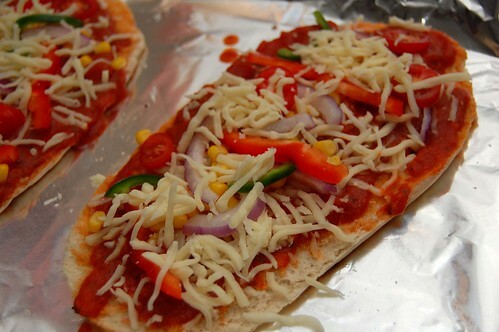 Bake your pizzas for 8-10 minutes, until cheese has melted. Let cool briefly and enjoy. 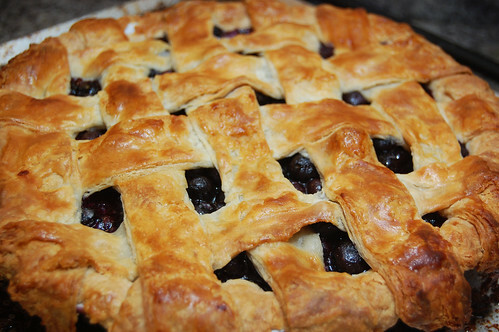 Food Photography – Blueberry Pie! Pictured: Blueberry pie that I made for my husband’s birthday last month. 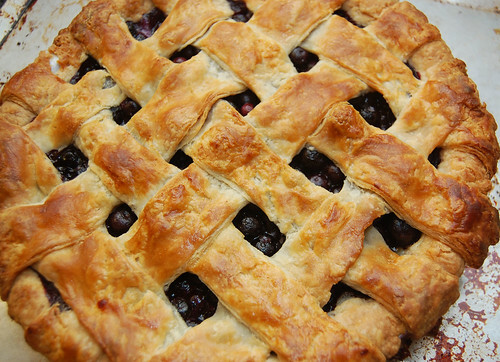 Blueberry filling from Simply Recipes and lattice crust from The Art and Soul of Baking. I finally got a chance to make something with the lychee my sister gave me as a gift, and after a weekend of eating from bags (I swear, I eat worse camping than I do at home) I opted to go the healthy route with a salad. I posted a somewhat similar recipe not too long ago using apples and lemon as the dominant flavors, but went much more mild this time around. 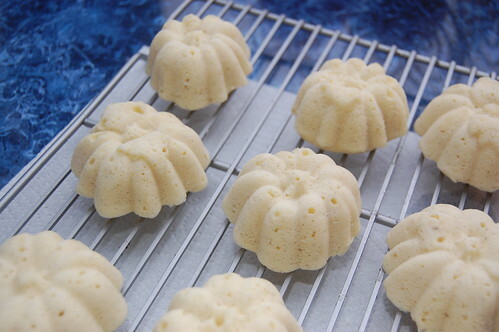 Lychee’s creamy flavor is soft and subtle so this won’t hit you like a punch, but still good for something different. 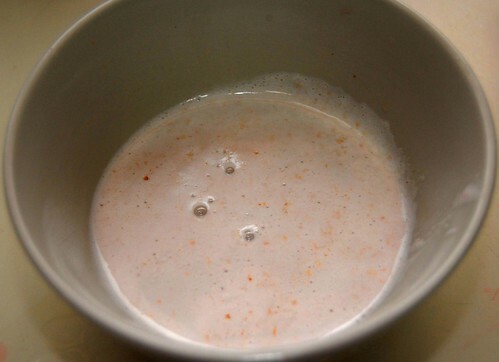 Blend the lychees and strain. Mix the juice, vinegar and olive oil to form your vinaigrette. This is pretty thin, so feel free to add more oil if you want it thicker. 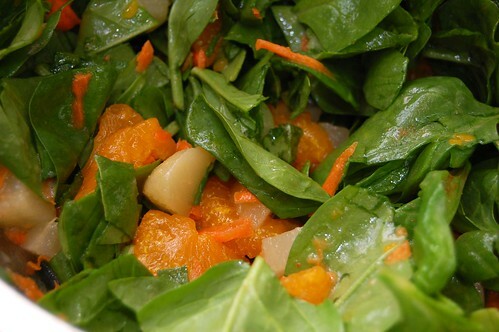 Toss your spinach and fruit together then add the vinaigrette. Enjoy. Woop woop! Today is Edwin’s Birthday! Please join me in wishing our favorite flexitarian a great day? The nursing program I’m starting next week assigned My Sister’s Keeper by Jodi Picoult as a summer reading book for all the incoming students (on that note – I was pleasantly surprised in the beginning; it wasn’t the book I thought it would be. But a twist ending left me aggravated). While about to purchase it at the bookstore I noticed the usual bargain book display in the checkout line, and a few interesting looking cookbooks caught my eye. For only about $8 I picked up Anheuser-Busch’s Great Food Great Beer cookbook. The book emphasizes beer pairings with food, but really it provides an assortment of simple and tasty looking meals that my husband or I could put together quickly on a weeknight – and as you know, that’s what DinnerCakes is all about! This recipe is adapted from a recipe for chicken thighs, because we never really buy or eat thighs. It doesn’t require much prep or cook time, but it does require a little time to marinate the chicken. I didn’t marinate mine quite long enough, so my chicken could have been a little more soy/satay glazed and less pineapple. 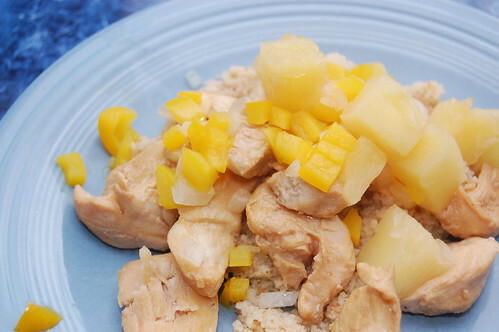 I probably like the Pineapple Mango Chicken Curry I made last month more, but this was definitely good too. This recipe would also work well with shrimp instead of chicken (or, hey, in addition to it). In a shallow dish combine marinade ingredients and stir. Cut chicken breast into one inch pieces and add to dish to coat with marinade. 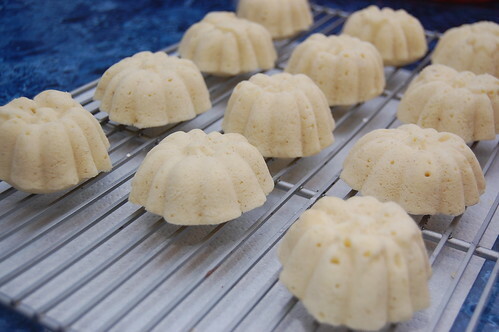 Cover and leave in fridge for at least 15 minutes, but up to four hours. 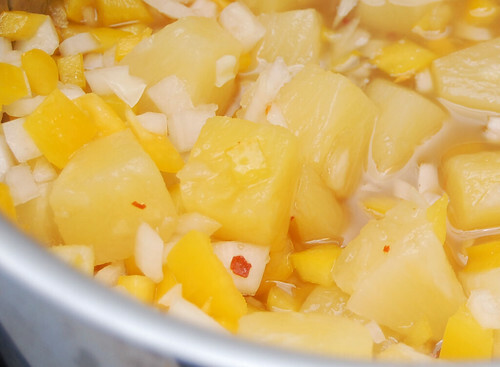 While chicken marinates, set a medium size pot to medium high heat and combine all relish ingredients (add pineapple juice as well, do not drain). Stir occasionally. Stir fry chicken pieces or cook on grill pan until white throughout (be careful not to overcook your chicken). 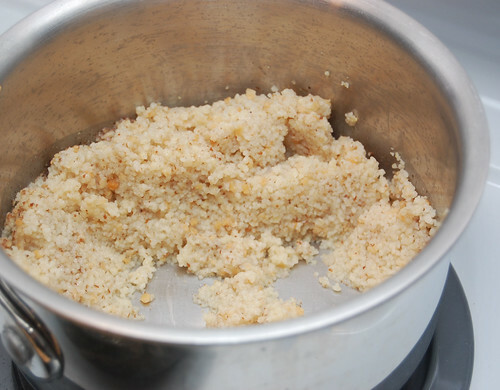 Serve with relish over couscous or rice. Food Photograhy – Some Exotic Fruit! 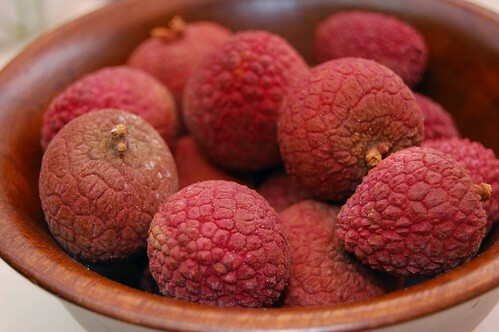 It’s my birthday this weekend (oooooold) and as a gift, my sister sent me some fruit I had never heard of before: lychee. It’s an asian fruit with a thin rough shell that holds a white, jelly like pulp. To me, it tastes creamy; almost like coconut. Asking around, the most popular way to eat it is just raw after peeling away the shell. I’ve done this with a few, and it’s good, but I really want to try an actual dish with them. After doing a bit of digging through my cookbooks, I’ve decided to try either a custard or a pudding with them (maybe both). 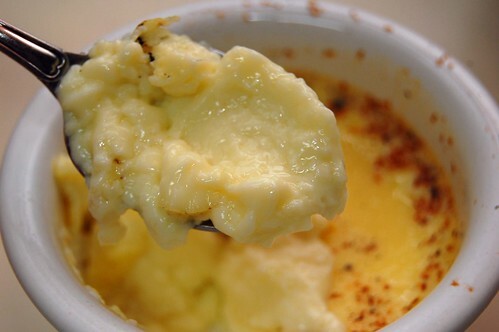 Of course, I had never done a custard before so I thought it best to try that first. With any luck, I’ll have some delicious results this weekend!